I thank everyone out there for taking the time to send in so many great questions for me to answer. Some questions were thought provoking, some were just good fun. They were all a joy to answer. I hope my answers give some insight into my approach to running The Judy Room site and blog. Plus I hope they give some insight into me as a person and what I’ve learned from navigating the online world of Judy “fandom” over the past 18 years . Questions that were similar to each other have been lumped into one question, and only a few are not included as they were completely off topic (but colorful, nonetheless). Other than those two variables, all of the questions are answered below. How did your interest in Judy first begin? I was born towards the end of the Baby Boomer generation. Like every kid (and most adults) of that era, I anticipated the annual showings of The Wizard of Oz. They were a big deal. Every kid in school would talk about it for weeks prior. My interest in Judy herself began after I bought the MGM Records soundtrack to the film. I was about 8 or so. I loved Judy’s voice, so I purchased the first Judy Garland album I saw. It happened to be a compilation of her Capitol recordings. The cover intrigued me because it featured the mature Garland, who was new to me. The difference in her voice from Oz to this new album, and the power she had seemed to attain, transfixed me. From then on, I would buy any Garland album I could find. To this day there are still certain recordings that never fail to send shivers up my spine. The Judy Room was established in 1999. Could you describe how and why it began? And how has it evolved over the years? Around 1996 or 97, the big thing with everyone getting online was photo sharing with family and friends. People encouraged me to share photos of my actual “Judy Room” online, and create one of those things called “websites.” Originally Jim Johnson at The Judy Garland Database shared my photos. I then looked into building my own site, and used one of the online services that allowed you to upload pages and images. This was before web authoring programs like Dreamweaver came along, way before you could hire a WordPress maintenance service. Only PageMill was out there, and it was bad. So, I learned how to code the old fashioned (and hard) way. I also learned by looking at what other people did with their sites, and how they did it. Slowly the site became more polished. Originally the focus of the site, after the Judy Room photos, was the timeline section. I learned and used Excel at work, and loved the fact that it made data gathering and sorting so easy, and that one could save documents as web pages (something fairly new at the time). I have always had an interest in timelines and that type of data. I announced on The Judy List that I was creating the timelines and if anyone had anything they’d like to add to please let me know. Steve Jarrett, who runs the Live Performances site, was nice enough to respond right away. He told me via The Judy List to feel free to use the information he had in his timelines. I then went through every CD and book I had, plus the other websites, to add as much data as possible. The timelines were the main focus of the site during the early years. Another early feature was photos from a few other fan collections, but that didn’t pan out as much as I had hoped. The site began to go in a different direction, with the focus more and more on upcoming events, products and random items. Some ideas came and went, while others lasted. I must mention that most people have been (and continue to be) quite helpful with feedback and constructive criticism. I’m very grateful for that. In 2005 I instigated the creation of The Judy Garland Online Discography. The genesis was a Rhino Records section I had attempted to create that was nice but was one of those things that didn’t pan out. I had really liked the discography that The Judy List’s Mark Harris created with “Little Girl Lost” author Al DiOrio. But I wanted more details and data, similar to the timeline information. That discography had been offline for several years when I got the idea to create a new, more detailed discography. With the help of many people out there, The Discography grew to become the cornerstone of the site that it is today. Lately I’ve been working on trying to get the filmography section completed, but The Discography is still my main priority. And my passion, because that’s what I’ve always been interested in from the very beginning when I first discovered Judy. So it’s only natural that I would gravitate towards that. The focus of The Discography has been the original and reissue vinyl releases. That decision was made because Jim Johnson’s Database already had (and still has) the most complete Garland CD listing online. The Judy Garland Online Discography includes the major CD releases, but it’s pointless to reinvent the data already so well presented at The JG Database. I have a feeling that The Discography will eventually be its own site, or overtake the rest of The Judy Room. Time will tell. The news blog is the most recent development. It wasn’t created for me to be “a blogger” and post inane things every 10 minutes, or to be a new discussion forum. I created it to replace the clunky “news” page and email newsletter at The Judy Room. Both of those had their day, but it is much easier to use the blog format to share news and information. The beauty of it is that it automatically updates all the social networking sites, and sends notices to everyone who’s an email subscriber. It saves a ton of time in that I don’t have to create multiple notices in multiple formats to get information out there. Plus it allows me to easily cover all the “big” Garland-related news, devoid of any bias. In other words, regardless of any personal feelings about the parties involved, I always promote and support all the major Garland releases. I think we all should. That’s basically how the site has evolved thus far. I didn’t think it would last this long, but I’m glad it has. It’s a fun hobby, I enjoy running it, and I’m especially thrilled that other people enjoy it too. As if that’s not enough, it’s also blessed me with wonderful new friendships. Since you are a computer programmer by profession, what are the technical challenges in realizing The Judy Room, the Discography, and the News Page? How many hours per week do you dedicate to keeping your various Garland websites running? Too many! Seriously, it varies. Some weeks I don’t do much at all, other weeks I’ll spend a whole weekend’s worth of time or more. It all depends on what else is going on in my life. Tinkering with it is a good stress release. If I had to pick a weekly average, I’d say 16+ hours. For clarification, I only have one website and one blog devoted to Judy. As I have used the The Judy Garland Online Discography on countless occasions to catalogue my Judy CD/MP3 collection, I have always wondered how exactly you have been able to create such an extensive and all encompassing site (that and the Judy Room). I have not seen anything else like it online, and that is inclusive of most corporate set-ups? Where on earth do you find the time? Could you tell us a little about the upcoming JSP set, Judy Garland – The Carnegie Hall Concert, for which you wrote the liner notes? The upcoming JSP set is the premiere release of the album on CD. It’s hard to believe, but the original album has never been available on CD. The complete concert has, which is wonderful as it includes all of Judy’s talking to the audience. These “dialog” bits were left out of the original album due to the time constraints of 12″ records. But for several generations of Garland fans, the original album is what they (we) grew up with. If you’ve never listened to the album version, you have a real treat in store. It’s a singular, thrilling aural experience that is missing from the complete version, as much as I love that one too. For fans who grew up with only the album this release will be a chance to revisit that listening experience, without wearing out yet another LP! I see this release as bringing the recording back full circle, a great addition to any Garland CD collection and the perfect companion to the complete version. In that you live in San Francisco, what in 2011 does Judy Garland mean to people there today? I haven’t taken notice of any particular mass attitude or anything. The Bay Area is huge, and naturally there are many Garland fans here. There are quite a few theaters in the Bay Area that cater to the classic Hollywood crowd. They almost always have Garland films on their programs. Because we have a huge gay population and of course, The Castro, I would guess that people are probably more aware of Judy in general than in the more rural areas. Recently a local female impersonator lip-synced the entire Carnegie Hall album in tribute of the concert’s 50th anniversary. I wasn’t able to go, but from all accounts she did a great job and it was a big success. So there’s obviously an audience for Judy. Likewise, local impresario and event planner Marc Huestis has done several Garland themed events over the years. They always fill the huge Castro Theater and are done with great respect. So again, there’s an audience. It used to be that the large urban areas like New York, Los Angeles, Chicago and San Fran were the only places to find “rare” Garland photos or other collectibles. That’s changed in the past 15 years or so, thanks to the Internet. For example, photos that we used to pay $20+ in some memorabilia shop can now be found on eBay for only $5. I think that’s wonderful. The fun of “the hunt” is partly gone, but the days of relying on trips to the big cities or someone to publish a new book just to get new Garland information and product are gone. Now anyone living anywhere who has an Internet connection has access to so much more information about Garland than ever before. Who can find fault in that? I see her as the epitome of what an “entertainer” should be, and what one can achieve when given a talent that is genius. When people ask me “What is it about her that attracts you?” I always respond with “It’s her voice.” That’s what first hooked me, and that’s what still gets me. I love to hear her sing. I also love to watch her perform, of course, because with Judy it’s not always just the aural. She was the total package. You can take away all the trappings, the collectibles and all that other stuff. Just let me keep the performances, in whatever the latest media format is. Her performances are her greatest legacy. How do you account for the fact that many of the Garland internet sites last a while then fade away? I would guess that some of it is luck. I also think that some of it has to do with design and providing something that people would be interested in. I think that people create sites out of their excitement and passion for Judy, only to find it’s more work and more time consuming than they thought, so the site just sits there, unfinished. That’s not a bad thing. We’ve all tried projects we thought would be fun, or something we’d want to do, only to realize that the project is more than we bargained for, or we simply don’t enjoy it. For me, it’s a hobby that I enjoy. If I didn’t enjoy working on it, The Judy Room wouldn’t be here today. I support and welcome new Garland-related sites too. I love seeing the various designs and ideas that people come up with. I don’t understand the odd competitiveness that certain folks seem to want to make everything into. The whole “my site is better/bigger than yours” mentality is silly, and counter productive. The Internet is more than big enough for all of us to play in, and each site usually has something unique to offer. Someone posted on Facebook that a new site is coming in 2012 called “Planet Judy” which they’re promoting as having the most complete filmography and discography on the web. I look forward to its launch. What is your favorite Garland film and song? For film, that’s tough. Of course, Oz and A Star is Born and Meet Me In St. Louis are at the top of the list. But so is her usually overlooked performance in For Me And My Gal. I also enjoy Summer Stock, Girl Crazy, The Clock, In The Good Old Summertime, Everybody Sing, and her guest appearance in Till The Clouds Roll By. What is your favorite Judy film, song, and outfit? Is there something big being planned in celebration of Judy’s 90th birthday next year? I’m hearing rumors about Liza and Lorna putting a concert together at either the Palace or Carnegie Hall with some a-list acts and I’m also hearing that there’s going to be a major book released by Barry Paris (who did the definitive bios on Garbo, Audrey Hepburn, and Louise Brooks). are these rumors true? I don’t know what Barry Paris has planned. I haven’t heard anything, nor have I read any of his books. If he does release a Judy book I’ll read it. I read every book about Judy that’s published. I feel that’s the only way to get a truly balanced perspective on what we think she was like. I say “think” because as fans I don’t believe any of us will ever know the real Judy nor should we. It’s my opinion that only those closest to her like her children, siblings, or her late husbands – and maybe someone like Roger Edens – knew the “real” Judy. Nothing is planned for Liza and Lorna at this time. Those are just rumors. That could change tomorrow or even next year, but at this time (July 2011) nothing like you asked about is planned. Is there a rendition of Judy Garland’s “Over the Rainbow” of Oscar night 1940? No, that version has not survived. The first half of your questions is covered above. My collection isn’t very big at all. My interests have been on Garland performances, so it consists mostly of albums, CDs, videos, DVDs – all manner of media. Plus random other collectibles. Oh yeah, a lot of reference books! It’s peanuts when compared to the amazing collections others have amassed. I know Judy was broke and deeply in debt when she died. I was wondering what her estate might be worth today? I have no idea, but Lorna Luft would know – she controls “The Heirs Trust.” Ask her. Did Judy and John F. Kennedy ever have a relationship? It’s been hinted at in many JFK bios that they had a fling before JFK entered the armed forces (that would make it before Judy’s marriage to David Rose). Not to my knowledge, aside from their well known friendship. Anything beyond that is just more rumor mongering. It’s my belief that she admired and loved Kennedy as a friend, and I’m sure that as a woman she probably thought he was handsome and may have had a normal woman’s attraction to him (who wouldn’t? ), but I’ve never read or heard anything that would make me believe their relationship went any further than friendship. Was Judy supposed reprise her role as Dorothy (voice over) in Journey Back to Oz? What happened? No, she was never attached to the project aside from being Liza Minnelli’s mother. There’s a disturbing scene in Mario Puzo’s novel ‘The Godfather’ that was allegedly based on an incident that happened to Judy. Can you tell us more about that? I haven’t read the novel, so I don’t know what disturbing scene you’re referring to. I haven’t seen any of The Godfather films for about six years or so. I don’t recall anything in the films that I thought was related to Judy. But you’ve piqued my interest. What was Judy’s opinion on rock n roll and R&B? I know that Johnny Rivers appeared on one of her Hollywood Palace guest hosting stints, The Supremes opened for her at the Houston Astrodome, and there’s accounts of her meeting Elvis, The Beatles, The Rolling Stones, Sonny & Cher, Aretha Franklin, Smokey Robinson, Brenda Lee, Stevie Wonder, Connie Francis, and Dusty Springfield among others. I never knew Judy personally so I would never claim to know what her opinion would have been on any subject, unless she stated so for the record. By all reports she loved talent of all kinds so I would assume that she probably enjoyed the music of everyone you listed. What about Judy keeps you inspired? I guess it would be her performances. Like revisiting a great film, I never tire of them. Whether they be on film or TV or audio. It seems that every year or so, something new is released, so that keeps things fresh. Usually it’s a newly discovered recording or previously unreleased material of some kind. The periodic books and tributes, like the festivals in New York going on right now, keep things fresh as well. Out of all the Judy projects that you have been involved in, or have witnessed over the years, which has been the most rewarding for you, and why? The Discography. That has been (and continues to be) a real labor of love. I’ve always gravitated to Judy’s recordings because when I was growing up, especially when we lived overseas, they were all that were available to me. To be able to pay tribute to her recordings by creating the discography, and the friendships with the many people who have contributed to it, has made it the most rewarding. That and the fact that in doing so I’ve learned so much more than I thought I would about her recordings and the history of the music business. Equally as rewarding was my work with the owners of the lost Decca recordings. When I confirmed that what they had was real, I urged them to transfer the recordings to digital ASAP. I had visions, after all these years, of someone dropping the very fragile discs. The two recordings were so historically important I offered to fly down to the Los Angeles area and take care of the transfer myself. I’m glad that everything worked out in the end, and that they’ve finally been shared with the public. If you were going to introduce Judy Garland to someone who didn’t know her, what would you show them or have them listen to? For films, I’d show them For Me And My Gal first. She does it all in that film in a way that makes one marvel that she was that good at that young of an age. A Star is Born is great for that too, but it’s a bit long for a lot of people as an introductory film. I’d probably go with Meet Me In St. Louis as a close second. For recordings, I’d start with Carnegie Hall, then play the early stuff like the 1935 Decca tests simply to show how her talent was God given. Which era of Garland is your favorite? Have you ever thought about writing a book about Garland? No. But I’ve always thought a “Judy at MGM” book done in the same manner as Hugh Fordin’s still amazing book on The Freed Unit would be great. Fordin’s book focuses on each film and tells the story of the Freed Unit through the story of the making of the unit’s films, which IS the story. He doesn’t go into too much about the rumors or dramas of the people involved unless it directly affected the making of a film, nor does he try to get into Freed’s head or anything. I hope John Fricke’s upcoming book about Judy’s movie career accomplishes this. That would be nice. What is your most prized Garland collectible? The most prized possessions I have are things given to me in love and friendship, regardless of their monetary worth. Who are the most interesting people you’ve met as a result of being a Judy Garland fan? Everyone has been interesting in one way or another. What Garland projects would you like to see happen? The top of the list would be a complete Capitol CD boxed set (with alternates), followed by a complete MGM Soundtracks boxed set. I would want the MGM set to be just Judy’s performances from the films, not the entire soundtracks. As extras, I would add the MGM Records versions (when different, which most of them were), plus all of the pre-recording sessions. Most of the pre-recording sessions are still only available on laser discs that have now been out of print for a good 15+ years. The folks at Screen Archives Entertainment recently released “The Belle of New York” on CD, indicating that perhaps they’ll pick up where Rhino Records left off. One can hope. It’s time that the soundtracks are remastered with today’s technology, which is light years ahead of the remastering in the 1990’s. The proposed Anne Hathaway film project sounds promising. But only if they use Judy’s voice and avoid some of the mistakes of the previous dramatizations. I think the problem in doing any dramatization of Judy’s life is that it’s too easy for filmmakers (especially these days) to focus on the sensationalistic aspects of her life. The general public’s image of Judy is that of the “little girl lost.” I don’t know how many times friends and associates have said to me: “Oh, I love her voice, it’s too bad what happened to her. What a shame.” Fans know that’s not the real story, but that’s the general consensus outside of our “Judy Fandom.” Having a name like Hathaway’s attached to it will bring in a certain audience, but to keep the word-of-mouth going, I fear they’ll fall back on the tabloid journalism/reality TV approach. I hope not. We’ll see. Like all Garland projects, I prefer to experience them on my own before passing judgment. I can assume all I want, but until I see the final product, it’s not my place to judge. Speaking of which, I’d like to note that there are those out there who automatically oppose most new projects without experiencing them. Some even go on smear campaigns against projects they haven’t seen, read, or heard. I find that incredibly narrow-minded, oppressive, and a form of censorship. Why not let people experience things on their own and make their own decisions? If I don’t like something and you do, it’s not fair of me to judge you for it. And vice versa. It’s not my place to tell anyone what they should like or not like. All I can offer is my own opinion on something, but it’s just that: my own opinion. We should all be free to make up our own minds about things without outside forces tainting our perspective in advance of that experience. Besides, if I took heed to every naysayer out there, I’d never experience anything! The Garland fan community is a notoriously cantankerous bunch. Bitching and kvetching seem to be the rule of thumb. What is your relation with this group? That’s a loaded question! I find the whole world of “Garland Fandom” to be incredibly fascinating, sometimes frightening, but never dull! I try to stay away from this “bitching and kvetching” group as much as possible. Any fan base will have its good and bad witches, I suppose. Most of us fall somewhere in between. I’m told by those in the entertainment business that Judy Garland and Marilyn Monroe fans are considered to be the most emotional and volatile, and the worst to deal with. The general consensus was put to me as “Oh, so-and-so’s one of those Garland nuts.” I suppose it’s because both icons had a certain vulnerability that attracts a particular type of fan. Now, not all the fans of these two icons are like this, of course, but evidently a higher percentage is. Considering the things flung at me and said about me (or to me) over the years, I’m not surprised by this generalization. Fortunately, this group is relatively small. Unfortunately, they’re usually the most vocal and over the decades have created and fostered the attitude towards Garland fans noted above. It’s been my experience that these people fit a particular profile. They’re emotionally crippled, so to compensate they have a near-pathological need to create and instigate negativity (“drama” as most people call it) out of thin air. That lack of emotional stability is offset by their huge egos. This results in their deflection of any accountability for, or acknowledgement of, their actions. They have a pathological belief in their own lies and the skewed reality they’ve created for themselves. They’re overly competitive and controlling to the point of being psychotically obsessive. It’s also been my experience that a good ninety percent or more of them are over 50 years in age, live alone with their Judy Garland collections, have no spouses (significant others, lovers, whatever you want to call them) or real home life – outside of spending way too much time obsessing about their perceived Garland-related “issues.” Any face-to-face socializing is almost always Garland-related. It’s fascinating to observe. As we all know, people say and do things online that they would never say or do in person. That’s one of the negative things about the Internet. My own relationship with “this group” has been at times quite volatile, to say the least. That’s because when these people have targeted me, out of my own stubbornness I’ve fed their “medicine” right back to them. They don’t like that. These people have only said or done these things online, of course. I don’t know them personally, so it doesn’t really affect me aside from being an annoyance or irritating. It’s like that saying “They don’t pay my rent.” And that’s true – if we worry too much about what people say or think about us, we won’t get anywhere. I had to learn that the hard way. I’ve been sucked into their “Garland drama” a few times, but I have finally realized that people will say and do whatever they want and it’s pointless to worry about it. For the record: In spite of the amount of attention these people have showered on me, any drama I’ve been involved in has been a result of their instigation. Not the other way around. Another “Garland Fandom” fascination for me is the phenomenon of the generational differences in attitudes and behaviors. Whenever anyone has been overly competitive with that whole “my Garland collection is bigger than yours” attitude, or the bizarre ownership issues they have with things like newspaper clippings published before they were born, they’ve always been a Baby Boomer. It’s the profile I noted above. That generation of Garland “fans” are also notorious for their dealings with each other. Theft, deceit, all kinds of crazy things. For example, one person of this group actually admitted to me that he purposely alters press releases sent to him so he can monitor where they show up on the web, and then go after those people for copying “his” text. And the press releases aren’t even his to begin with! As Kathy Griffin would say: “Cuckoo!” I wish I had the time to monitor where things show up on the web, I certainly wouldn’t spend it doing that! Not all Baby Boomer’s are like this of course, but if anyone IS acting in this manner you can bet that more likely than not they fit this profile. On the bright side, since the Internet opened up the playing field the younger generations don’t usually fit that same profile. They’re not concerned with vainly attempting to control the flow of information. They know that once something is online, that’s it. But (most of) the Baby Boomer gang still don’t get it. They still have hissy fits whenever they perceive a threat to their self-proclaimed ownership of something as mundane as a photo. My attitude is: If you don’t want people sharing “your” item online, don’t post it. I used to put a Judy Room watermark on photos (some are still there), but I finally realized that it doesn’t matter. Why should I care if someone shares a photo from The Judy Room? I didn’t create that photo (only the original site graphics). I probably bought it on eBay. Besides, that’s why it’s on the site to begin with – to share! The social networking sites have been a major factor in this generational shift. People copy and share things all the time, from a variety of sources, and within seconds. Never have I ever heard any of the social networking generation say things like “how dare you share what I shared – that’s MINE!” Why? I think it’s because they all share with each other all the time and grew-up in that environment. I love going to someone’s Facebook page and seeing the photos they’re sharing. No egos, no weird ownership issues. Just information sharing. It’s wonderful. Now that I’ve said more than enough about the “bitching and kvetching” crowd and my nutty experiences with them – I want to point out and stress that thankfully these experiences have been in the minority. Sure, the online shenanigans make for great copy, but in reality the majority of Garland fans that I have met online or in person have been wonderful, easy going, pleasant people. I enjoy our emails and conversations, meeting for coffee, discussing a mutual excitement over some new Garland related project. For that, I’m thankful. 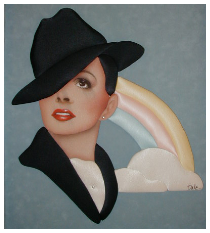 The Judy Room and The Judy Garland Message Board were sister sites until 2010. What happened? According to board’s new URL, we’re still sister sites. It’s a long story, with most of the themes covered in the “group” question above. Suffice it to say we experienced a mutual failure to communicate. Scott, do any other pre-recordings exist from Annie Get Your Gun, other than what’s already been released? I’ve always wondered why the tempo of “You Can’t Get a Man with a Gun” is slower than usual. It seems like Judy is holding herself back from ripping into it. Someone suggested to me that other versions exist, but they were deemed inferior and will probably never see the light of day. Is this true? It’s possible. However, given the MGM pre-recordings that have already been released on CD, DVD, and laser, I can’t see any reason for the producers of those projects to hold back, especially if it’s a significantly different version. Look at the various pre-recordings released from “The Pirate.” Some of those are pretty sub-par, but they’re historically important. Besides, if an alternate version was done that was that different, it would have seen the light of day by now. I would love to be proven wrong. Why wasn’t Judy loaned out to rival studios during the peak of her film career (I’m not counting Pigskin Parade)? MGM loaned out Clark Gable, Myrna Loy, Lena Horne, Jean Harlow, Gene Kelly, Spencer Tracy, Rosalind Russell, Lana Turner, Van Johnson, Maureen O’Sullivan, June Allyson, Hedy Lamarr, Janet Leigh and Robert Montgomery to other studios during their golden years, and I’m just thinking about how she might have done if she had filmed a picture at Paramount, Warner Brothers pre ASIB, Fox, Columbia, etc. In the early-to-mid 1940’s Judy was simply too busy. Musical films took longer to make and were more expensive to make than a basic drama or romantic comedy. MGM wasn’t about to give up one of their biggest stars for that amount of time. It was more lucrative to MGM to loan out someone like Myrna Loy for a few weeks, at a high price, than to loan out Judy Garland for a solid six to eight weeks (or possibly more). By the late 40’s not only was Judy MGM’s biggest female star, she also wasn’t making as many films for a variety of reasons, mostly personal. Her contract by that time called for her to give the studio two films a year, and getting that out of her became a struggle. No way was MGM going to loan her out. They wanted their money’s worth! Do you have any information about a more comprehensive release of Judy’s radio work on CD? And why it is taking so long to get to the public. I have done research, as many others have, on the Jackie Oakie Show and Bob Hope Pepsodent Show. The Library of Congress hold much radio material. But I just get any answer about release dates. Nothing I know of is planned at this time. With the CD market going down the tubes as the digital download market continues to dominate, comprehensive CD sets of niche markets are less likely to be released. They’re just not lucrative to the labels. However, there are still small companies out there who continue to release to the niche markets, like Sepia Records and Screen Archives Entertainment. Many of the overseas labels have been releasing CDs that may never be released by the “major” labels. Getting access to recordings from the Library of Congress, paying for their use plus the costs of the production, is a completely different story. I don’t have much hope for a big new set of radio performances anytime soon, if at all. The most recent release was the JSP “Lost Tracks” set. The Smithsonian put out a nice set of complete Garland radio shows in 2005. In 2008 Freméaux & Associés put out a nice set as well. 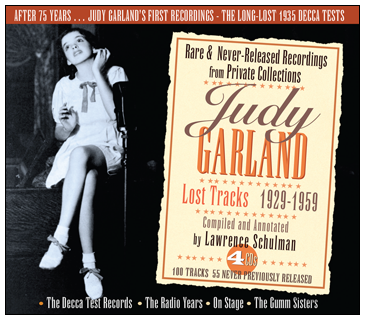 The Judy Garland Online Discography has information about these and other radio related CD releases. In regards to Judy Garland’s controversial Australian tour of 1964, would you agree that this watershed period in her life has been scantly, inaccurately and appallingly reported in every biography of Judy Garland thus far? Also, do you think that her journey to “OZ” warrants its own specific and detailed treatment in the form of a book, documentary or feature film? Frank Sinatra has been afforded the honor of a film recapturing his controversial time in “OZ” – “The Night We Called it a Day.” There are many questions that remain unanswered. Check out his memoir – the Garland section reads like Mel Torme’s or Torment (The Velvet Smogs) cash in. For the record I am an Australian and ardent lover of all things Garlandia. But really I just love her – warts and all. Thank you for your brilliant honoring of her in her entirety. I have not read Miller’s account. I do find it interesting how people who have spent a relatively small amount of time with her are so quick to pass judgment or write about her with some sort of authority. I’m no expert about this time in Judy’s life, but what I gather from all of the books and other accounts, the lasting legacy of the tour is much more salacious than what really happened. I don’t think a documentary about it would be lucrative to any film company, so I doubt that would happen. As with my note above about dramatizations of Judy’s life, I think a film about this period would probably focus more on the tabloid aspect, rather than the complete truth. I love Judy “warts and all” too. I think it’s a disservice to her memory and legacy to never admit that she had human frailties just like the rest of us. Too many people out there put her so high on a pedestal that their image of her is false and something she could never live up to. If cost wasn’t a question – what Garland item would you most like to own personally? The Ruby Slippers, most definitely. Thanks Scott for taking the time to share with us, and to inform us and enrich our “Judy-lives”. I have to agree with one thing you said…I love the V.O.T.D Pantsuit myself…LOL. How many colors did it come in?…LOL. I’ve seen the original, and the white version, were there others??? Fascinating interview, Scott. Your untiring work on The Judy Room, The Discography, and the News blog over the years deserve recognition. There are no other informational sites on the Internet concerning Judy Garland that are as up-to-date, inclusive, and pleasurable to read. Your levelheadedness and wisdom in the above interview reveal the three-dimensional person I have come to know and appreciate. You are truly “a wonderful guy.” Keep up the good work. Found this interview fascinating. I’ve been a Garland fan since I was five. That’s 46 years now, and like how you think of Judy. Very similar to my views of her. I don’t think a day goes by that I don’t think of her. I too love all the “eras” of Judy…MGM years are my favorite…but love them all. wonderful interview Scott…As you probably know I have been a Judy fan for more years than I care to remember. I too get bored with some of the fans that are over obsessed . Yes I love Judy but I also have a life outside of that. I enjoy going to the Judy Fest in GR Minn every year and we are like a family there ,but a few get over zelious (is that the right word) ..Did we meet in NY in April? so many there I don’t remember everyone.I want that new Carnegie CD ….There is so much that wasnt included in the original.I was there .I was lucky enough to meet her on several occasions ,What a great sense of humor she had. .
as founder and host of PALACELITE: BEYOND THE EMERALD CITY, i came to know scott as an extremely helpful (unusual in the judy world) friend with vast knowledge and a great willingness to help me with advice when i was working thru the growing pains of PALACELITE…i have always appreciated his generosity and friendship over the years. 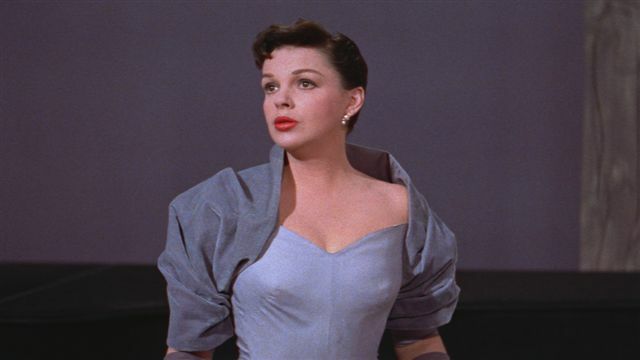 I love the header photo of Judy on ‘the Judy garland timeline’ any ideas where I can find the un cropped version please ? I can’t find that photo anywhere !!! As a long-term record collector, my collection includes a number of early Judy Garland items, from movie discs to radio air-checks to MGM Transcriptions . . . I am not a techie, and do not go onto Facebook, but I would like to ask a few questions about the dating of some items, as there are variances in comparison to some original discs in my collection. This seems like a most knowledgeable venue and would appreciate hearing back ( and I might well be able to add some rare label photos to those I’ve seen ) . . . I should wish to do so through regular emails.